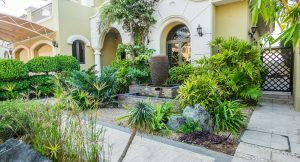 If you live in an arid region where lush lawns are difficult to achieve, consider desert landscaping ideas with plant life and materials which work with your natural surroundings. 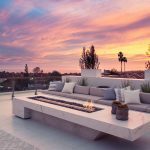 With a little help from the experts at Milestone, you can create a dynamic desert landscape design to turn your backyard into your personal oasis. Regardless of the size of your space, you want to create a focal point to work around. Showcase your favorite plants in a place where they are most likely to be viewed. For example, you could position striking plants and large plant combinations to highlight your backyard entrance. 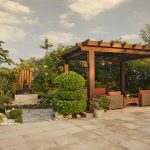 You could also feature your plants around your pergola, gazebo, or outdoor dining area. Ultimately, place your plants where you’ll be able to enjoy them the most. A patch of Opuntia, also called a prickly pear cactus, offers seasonal color with flowers that bloom through spring. The Hibiscus rosa-sinensis, or China rose, flourishes in the sand with stunning red, or yellow flowers. A stunning Adenium, commonly called a Desert Rose, will inject a bold splash of red to your landscape. A palm-tree like beaked yucca (Yucca rostrata) can inject a dramatic crowning touch to your outdoor space. 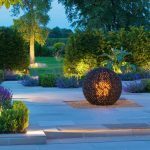 *For more plant ideas contact a Milestone landscape design expert. 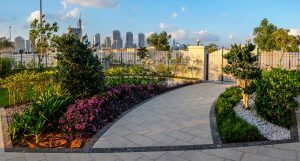 When it comes time to select your landscape elements, the shrubs, rocks, trees, and flowering plants in your yard should complement each other. This doesn’t necessarily mean every design element should be the exact same size. However, as you plan your desert landscape design, scale should be your guide. For example, a ring of shrubs positioned around larger desert grasses or flowering plants will create emphasis and density. Larger rocks and boulders can serve as walls or be used to define a specific space (i.e. a path or outdoor dining area). 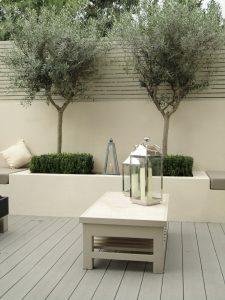 Using a large Olive tree as a focal point in a raised planter box could prove very interesting. The thick trunk and form of the Olive tree is absolutely amazing. Using a large tree of height 3 – 4 meters that is mature like, Cassia Fistula, Cassia Javanica, Bauhinia, Delonix Regia will create a great ambiance over time. Lighting up the tree with hanging bulbs will certainly create a feature! 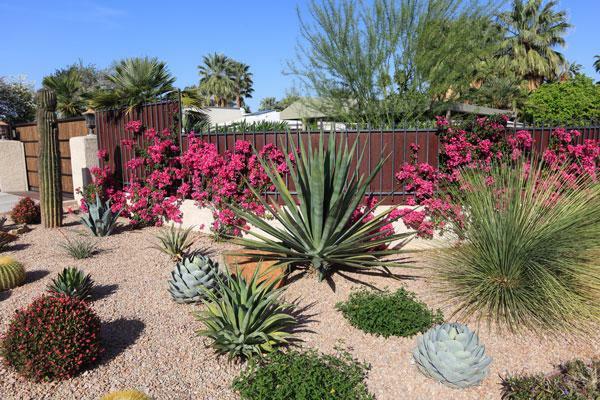 When it comes to desert landscape design, selecting the right colors is essential to creating a harmonious space. Colors should be introduced into your landscape design strategically. 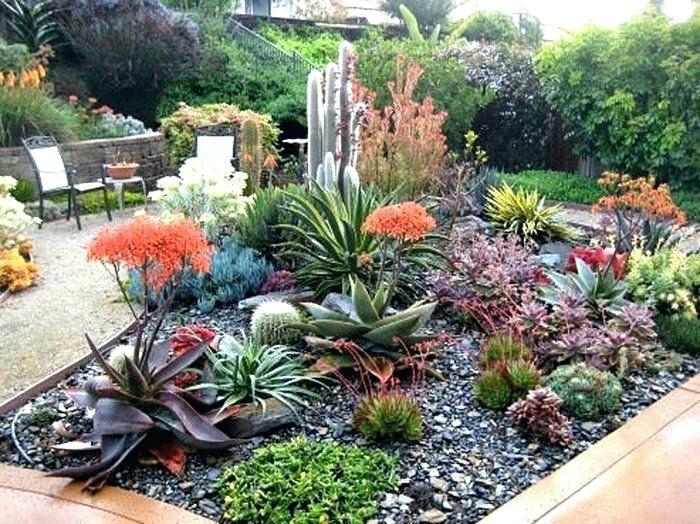 Warm yellow, purple, green and red succulents create excellent focal points in any backyard garden design. 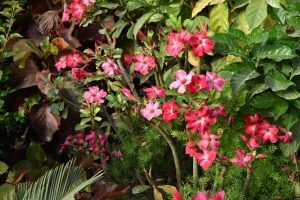 Additionally, these versatile, drought-resistant plants can be potted or planted directly into the ground. 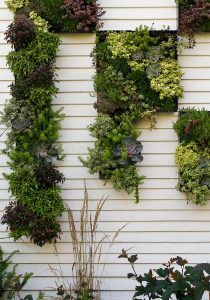 You can even add them to a living wall for a pop of color. 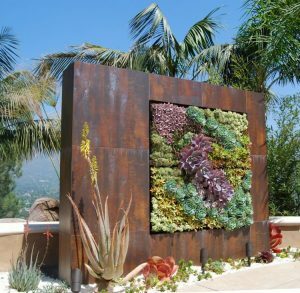 You can also add color to your desert landscape design with natural rocks, or by incorporating colorful furniture and art into your design. 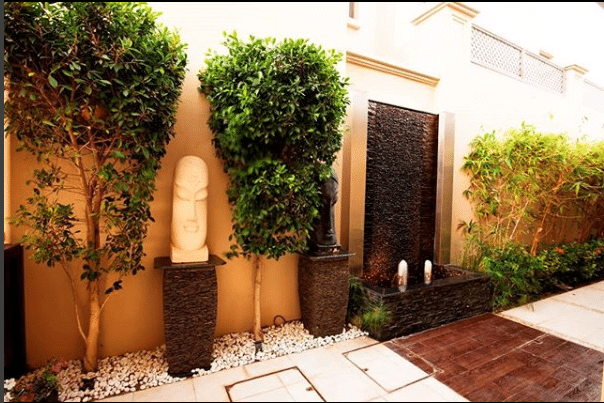 Use of crushed or polished pebbles and planting fewer plants could enhance the desert theme further. 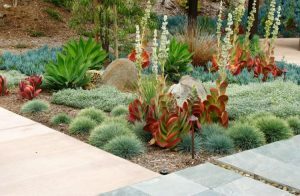 A few well-placed drought-resistant plants can do wonders for your landscape design. 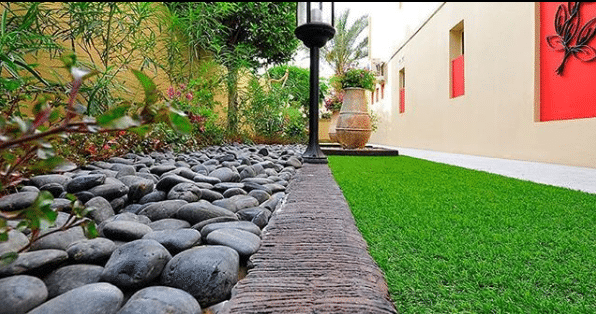 Derived from the Greek xeros meaning dry the term means literally dry landscape – xeriscaping is the art of combining minimalist vegetation with a simple, yet attractive natural foundations (usually pebbles or rocks). 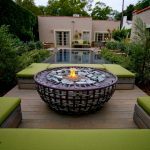 This intriguing landscape design form is a popular way to landscape backyards in arid regions. However, just because you’re opting for minimal plantings, does not mean you can’t get creative! Consider including some unique rock formations, eclectic pottery, or a natural sculpture, such as a skull to create a creative, artistic appeal with intrigue. 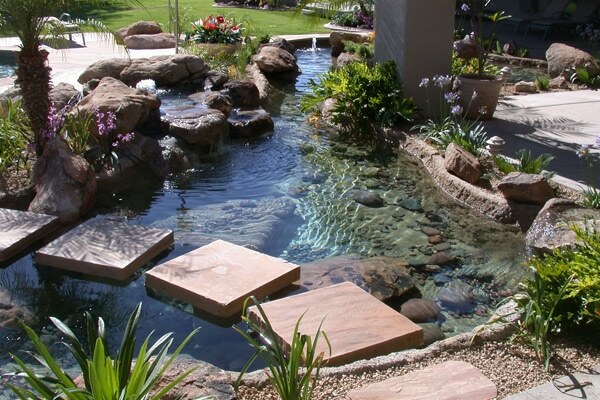 If you prefer a desert landscape design with a bit more depth, consider adding a pond or custom water feature. 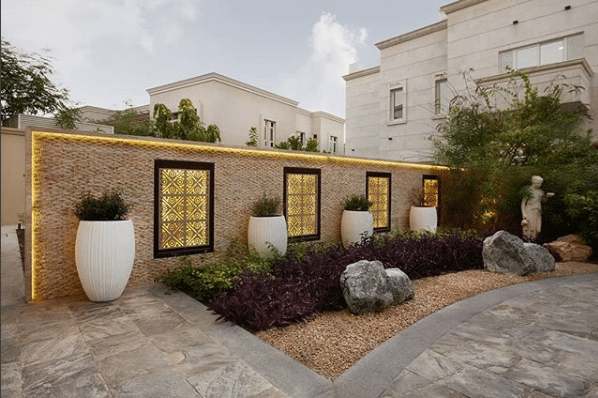 A lovely pond, with a waterfall feature will help the water of the pond to circulate, and the mirror-like surface will reflect the stunning sunrises and sunsets for an added experience. Here at Milestone, our design team wants you to love every inch of your backyard. 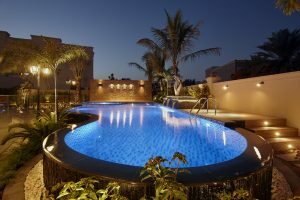 We encourage you to visit our show villa or to contact a member of our team to schedule your free design consultation. 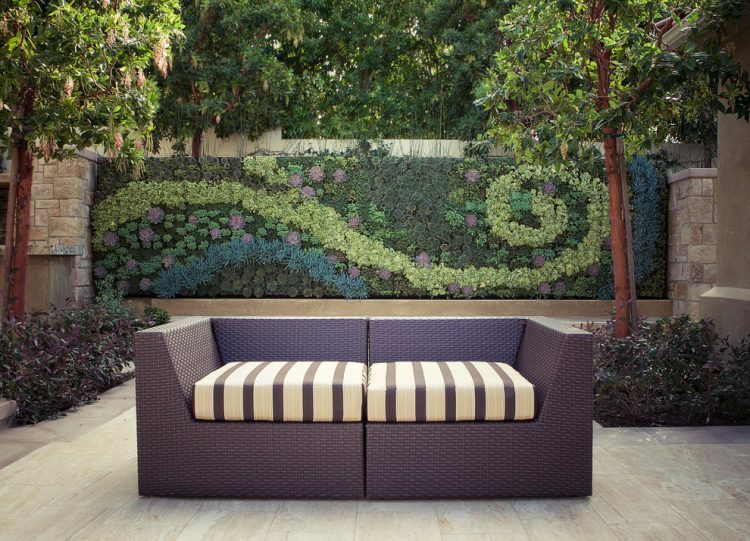 Together, we can transform your backyard into your personal oasis.